Urinary tract infections are very common. They can be painful and uncomfortable. Lifestyle changes, stress, medicines and disease can sometimes deplete our beneficial gut bacteria, allowing E.coli to become established and cause infections. These infections can damage mucous membranes which line the urinary tract. 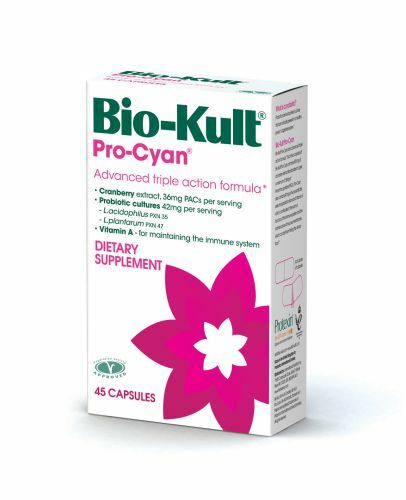 Bio-Kult Pro-Cyan is a triple action formula scientifically developed with cranberry extract (36mg PACs), two specifically selected probiotic strains and Vitamin A, which contributes to the normal function of the immune system and maintenance of the mucous membranes, which can be found along the urinary tract. May contain soya and milk as these are used in the growth media of the strains. Traces of milk are at a level that would not affect lactose intolerance sufferers. Made in the UK by Probiotics International Ltd (Protexin). Minimum of 18mg cranberry PACs and 500 million live probiotic microorganisms (>5 x 108 CFU/capsule), equivalent to 2.7 billion live microorganisms per gram (>2.7 x 109 CFU/gram). Concentration of 500 million live microorganisms per capsule is guaranteed throughout the shelf life. Children under 12. Take half adult dose. Bio-Kult Pro-Cyan has been formulated to be suitable for use during pregnancy, but we would always suggest consulting your doctor or healthcare practitioner before taking any food supplement.